They have begun to make themselves known around the world, in Europe, in the USA and even in areas of South-East Asia. Specifically, let’s have a look at the situation of Alibaba AliPay in India. What is Alibaba's Position in the International Payment Market? While not entirely new information, there has been a confirmation that Alibaba intends to move into some South East Asian countries as we mentioned earlier. Forbes forecast that Alibaba International Commerce section will contribute with 4.8 billion USS by 2020, this is the 16% of the total increase expected. Alibaba has recently made a massive move in India when they have invested 177 million USD in the Paytm company bring their holdings up to 40%, and soon they will increase their holdings to 62%. The competition in this market is quite fierce as they have to face Amazon and the local leader Flipkart. If you haven't heard about Paytm, it is the largest mobile payment processor in India. It was a smart move for Alibaba because, at the end of 2016, the Prime Minister of India decided to remove both the 500 and 1000 rupee banknotes from the circulation. The reason for this change is to fight against corruption in the country, and this will help India to move into the 21st century by forcing its citizens to use the banking and electronic payments systems more frequently. Why Has Alibaba Invested in Paytm? With the announcement from India's Prime Minister, Jack Ma from Alibaba saw an opportunity that he couldn't pass up. Moreover, if you have a look at the growth of the monthly transaction volume, it has not stopped increasing since that announcement was made. Before the announcement, Paytm was not very well known by the average household. However, since that change, the company has started to become more and more popular. They signed up 5 million new users between November 8th and November 21st alone! That means they had around 400,000 new users every day during this period and they reached 7 million transactions per day. This numbers shows how wise was the investment of Alibaba in Paytm. Another interesting fact about Paytm is that they do around 75% of their transactions with mobile phones (mainly with Android). That makes it even more appealing for Jack Ma and his Alipay. In keeping with its objective to reach the international market, Alibaba saw a great opportunity in India because they know that there is a considerable potential as the country continues to develop. Knowing that the number of credit cards and saving accounts is quite low, they can help to increase the economy of the country. Another aspect of this investment is that Alibaba will have access to a new labor market with a great potential. They have already put their knowledge into action by helping develop Paytm and by hiring local, highly skilled, people to drive this project to success. What Could Be the Future for Alibaba and Tencent in India? 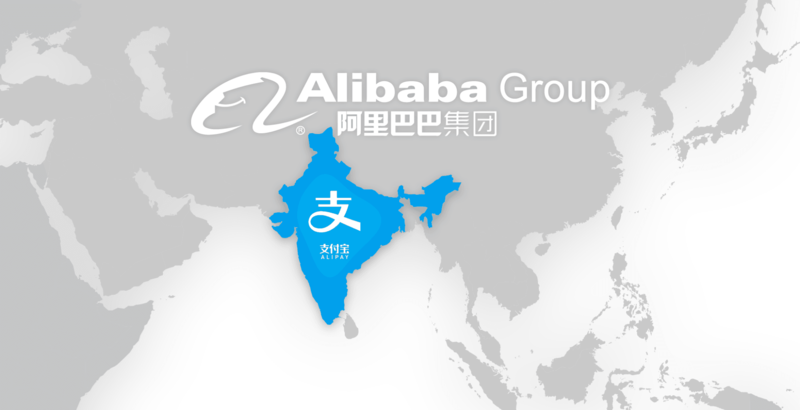 With this strategic investment in India, Alibaba – Alipay took a big step forward. Tencent will now face a great challenge if they want to reach this market. As Alibaba made the first move by finding an exciting opportunity, let’s see if Tencent's WeChat Pay will be able to find an opportunity/investment as good as Paytm, or if they will even consider targeting this market. As you can see Alibaba continues its internationalization by reaching new markets through different methods, and we will wait for Tencent to make its move and see how they are going to react to this big news. If you have been using WeChat Pay or Alipay within China you now have the opportunity to use them out of China, and who knows exactly where they will go next. With their intensive efforts to go international, you may soon be able to use it almost everywhere. If you would like to have more information about this Alipay in India, or if you are interested in implementing Alipay or WeChat Pay into your business we can help you do that, please do not hesitate to​ contact us.